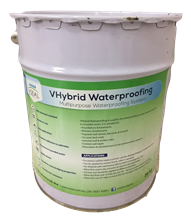 VHybrid Waterproofing Paint is an elastomeric liquid applied hybrid PU Acrylic based waterproofing coating/membrane formulated to provide a durable, minimal care waterproofing protection for concrete substrates. VHybrid offers the most advanced waterproofing technology and cate to provide a long lasting performance & security of a waterproof environment. VHybrid coatings forms a tough rubber like membrane when fully cured. It is completed free from coal tar, bitumen and other hazardous components. VHbrid Waterproofing Paint is UV Resistant coating that can be exposed to Sunlight and when it dries , it forms a tough rubber like surface. Chemical Resistant. Resistant to diluted acids & alkaline, oil. salts, bacteria and common ground salts. Easy Application. Can be applied by brush, roller, squeegee, spatula or airless spray equipment. Excellent adhesion to green & cured concrete. Excellent UV resistance. Suitable to tropical climate country. VHbrid Waterproofing Paint can be delivered in several types of system that cater the needs of the end users. 3 Layer VHybrid Waterrpoofing System is the waterproofing system that applied without the VFlexi Fabric. This waterproofing system is more cost effecient. 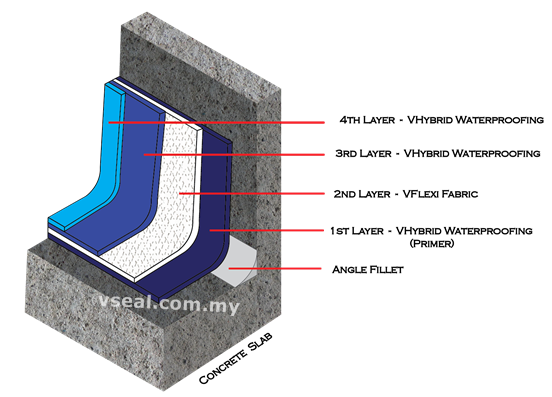 In general, this 3 layer waterproofing system shall provide a minimal thickness of 1mm. Any questions? Need consultation? Feel free to find us at facebook (vsealmalaysia) and drop us your message , we will attend your inquiry soonest possible. or call us at 03-5021 9289. Plan to do the Waterproofing by yourself? Let's check out the following video.